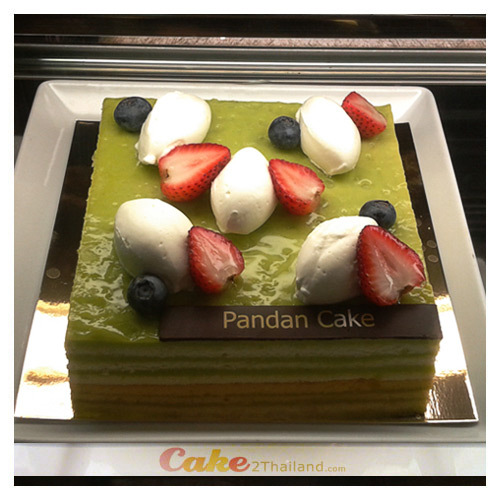 Pandan, Coconut Mouse Passion Cake is moist, flavorful with fresh Pandan. Pandan, Coconut Mouse Passion Cake, G7 Moist, flavorful with fresh Pandan Coconut Mouse dessert recipes for all occasions Special recipe from Cake 2 Thailand ® Presented in a beautiful gift box. Sure to be impressed. Just perfect for a Mother's Day celebration! Free delivery in Bangkok and surrounding area. Same day delivery now available. Place your order by 6pm. (US Time Zone) or 12pm. (UK Time Zone). Your cake will be delivered the same day or within 3-5 hours. (Please note however if your preferred cake is not available we may substitute another cake).